Facing Out was inspired by meeting Bern Corri whilst I was painting in the atrium at Manchester Royal Eye Hospital during the CurARTive project. Bern had just lost his eye to a facial cancer and was about to embark on an extensive programme of reconstructive surgery. We hit it off (which is hard not to do with Bern-he's a love and funny as you like) and struck up a friendship which has led to his being the first portraiture subject of Facing Out. Bern is a one man 'raising awareness' media outlet and through his honest, open and often hilarious Facebook posts, I was able to follow the progress of his facial reconstruction. The process was obviously arduous and distressing but Bern's humour never seemed to fail him and I hoped to try and reflect that in his portrait. Visitors at Maggie's who saw the work develop often commented on the 'twinkle in his eye' and that Bern was clearly 'a character', so I think that some of Bern's personality must have been captured! Bern is a poet and I really enjoy reading his work, particularly those poems that address some of the challenges that are faced by people who find themselves unable to work because of illness. 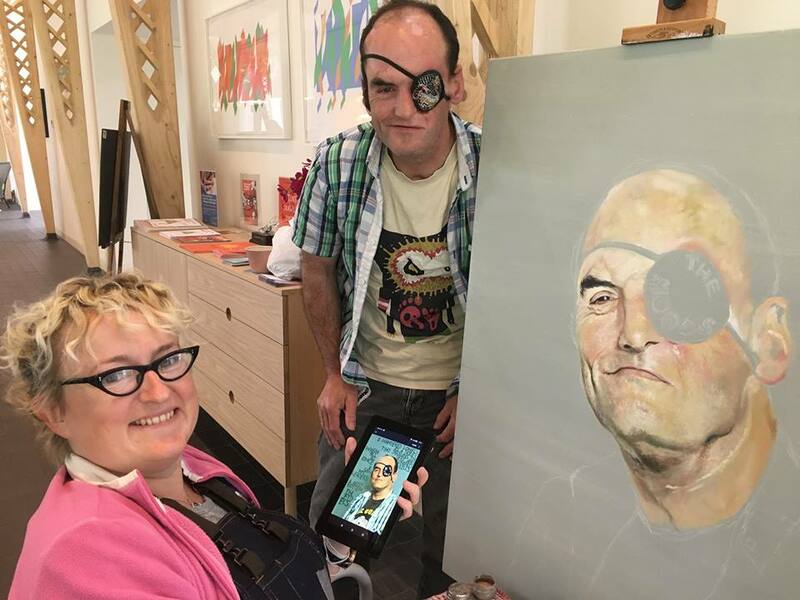 It was great to be able to share some of Bern's poetry by incorporating it into his painting, especially when fellow cancer patients who have seen the painting have been moved by recognising a shared experience.